Regarded as a masterpiece today, 2001: A Space Odyssey received mixed reviews on its 1968 release. Despite the success of Dr. Strangelove, director Stanley Kubrick wasn’t yet recognized as a great filmmaker, and 2001 was radically innovative, with little dialogue and no strong central character. Although some leading critics slammed the film as incomprehensible and self-indulgent, the public lined up to see it. 2001’s resounding commercial success launched the genre of big-budget science fiction spectaculars. Such directors as George Lucas, Steven Spielberg, Ridley Scott, and James Cameron have acknowledged its profound influence. 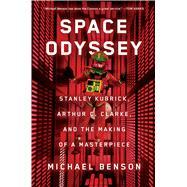 Author Michael Benson explains how 2001 was made, telling the story primarily through the two people most responsible for the film, Kubrick and science fiction legend Arthur C. Clarke. Benson interviewed Clarke many times, and has also spoken at length with Kubrick’s widow, Christiane; with visual effects supervisor Doug Trumbull; with Dan Richter, who played 2001’s leading man-ape; and many others. A colorful nonfiction narrative packed with memorable characters and remarkable incidents, Space Odyssey provides a 360-degree view of this extraordinary work, tracking the film from Kubrick and Clarke’s first meeting in New York in 1964 through its UK production from 1965-1968, during which some of the most complex sets ever made were merged with visual effects so innovative that they scarcely seem dated today. A concluding chapter examines the film’s legacy as it grew into it current justifiably exalted status.